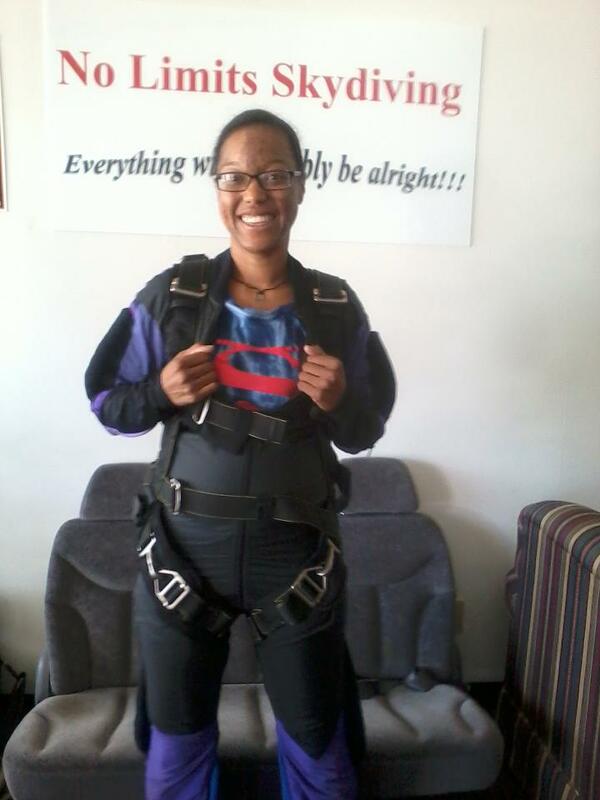 I threw myself out of a moving plane at 13,500 feet. I have to say, I wasn't nervous. I had so much FUN. The instructors were fantastic. The weather was perfect. I convinced a friend of mine to go with and we took the drive down to the West Point office of No Limits Skydiving--these guys are great!!! very experienced. Matt (The head of the company) and Dallas were our jump team. They got our gear together, ran over some quick instructions and then took us across the road to the airport. The whole time we were relaxed and joking--singing in the car actually. And then... we loaded into the smallest plane I have ever seen or been in (if I had stretched my legs all the way out I probably could've touched the front and the back of the plane at the same time...lol) and we took off. We talked over top of the engine noise--still laughing and joking. This is probably the only point where I got slightly nervous because I was told at some point I was going to have to turn myself around (and I'm slightly clausterphobic...go figure...lol). So we climb higher and higher and I'm able to get a good idea of the view and the layout...and THEN...I hear the pilot counting down as we get within range of the drop zone and they pop the door open. I now have to turn my body around with the door of the plane open. Matt helps me pull my goggles down and then tell me to swing my legs out of the door (HUH??? lol) and try to put them on the step...The wind was blowing so hard my legs were going SIDEWAYS. Before I could get them down we were falling through the sky. My eyes were open. We were free falling (at 120 mph mind you). The air was so cold I could barely catch my breath (if you see the video--you can clearly see me trying to pull air in). BUT IT WAS SO BEAUTIFUL. It wasn't scary like a rollercoaster drop...it felt more like floating in slow motion. Matt pull my hands to the side--I was flying! I think all I could say for about 15 minutes was the word "awesome!" Really there was no other word in my vocabulary for it. After, we packed up the gear, drove back to the office and it was all over. Item #27 is now complete. 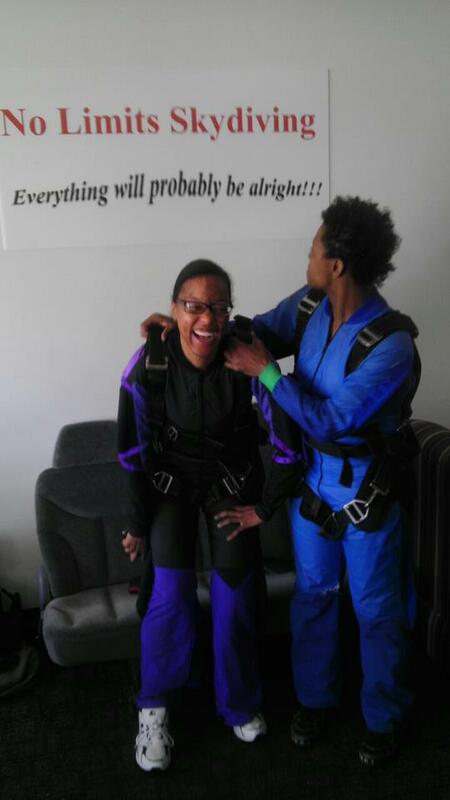 Thank you to my homie Dava for jumping with me! And definitely BIG THANKS!! to Matt, Dallas and No Limits Skydiving for the BEST experience << HIGHLY RECOMMEND THESE GUYS!!! I'm loading the video now so I can post it.